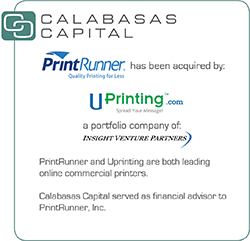 Calabasas Capital is pleased to announce the successful sale of its client, PrintRunner.com, Inc. to Uprinting.com, an asset held by Digital Room, Inc., which in turn is a portfolio company of New York-based Insight Venture Partners, a private equity firm. Calabasas Capital advised PrintRunner on strategic alternatives and ran a sale process soliciting interest from several strategic and financial buyers. Based on a variety of factors, PrintRunner selected to proceed with Uprinting to consummate the transaction. We negotiated on behalf of PrintRunner, quarterbacked the entire due diligence process, advised on structuring and worked closely with the attorneys on documentation. Both buyer and seller were in the exact same industry (online commercial printing) and located in facilities just 10 miles apart outside of Los Angeles. The owners of PrintRunner were able to realize significant liquidity in a tax-efficient sale of stock while Uprinting was able to realize significant revenue and cost saving synergies within a short period of time following closing.